Wag Lifetime Joint Care is a natural joint supplement that has shown to work on dogs of all ages, breeds and sizes, improving the quality of our dogs’ lives. Wag Lifetime Joint Care has been shown to be effective in as little as 7-10 days! Your Dog May Be In Pain and You Wouldn't Even Know It! Because of the unique structure of the canine central nervous system, dogs often don’t display physical symptoms of pain until they’ve undergone significant distress. As many dog owners know, arthritis and joint tissue problems can be some of the most distressing and debilitating diseases our dogs ever face. 20% of dogs show signs of canine arthritis by the age of one year old. That’s at ONE YEAR OLD. Scary! The chances your dog has canine arthritis get worse with every passing year. Many dog owners have been misled into believing arthritis in dogs is strongly correlated with very active lifestyles. Here’s what’s actually happening. Chemicals, pesticides, and other foreign substances present in today’s modern world are assaulting your dog’s immune system every hour of every day, triggering an inflammatory immune response. The inflammation escalates to full-blown arthritis earlier and earlier every year. What If No Signs Are Readily Visible? There’s a strong chance that whether or not you observe symptoms that your dog has probably already developed some degree of underlying canine arthritis. Most dog owners write off this sad truth as a fact of owning a dog. But true dog lovers understand it is their responsibility to learn everything they can about what can be done to save their dog from crippling pain, restricted mobility, and a declining quality of life. What Happens If You Fail To Take Action Now? It’s almost impossible to shield your dog from the chemicals and other things that cause and irritate canine arthritis. But if you take decisive action right now, you can block most threats to your dog’s joint health and prevent what could be years of anguish. It Is Your Job To Help Give Your Dog a Health, Happy Life! Is your dog on glucosamine and chondroitin? So you have taken action and have been giving your dog glucosamine and chondroitin. That’s great, but are you really helping your dog? Is it really working? Glucosamine and chondroitin have been some primary ingredients in animal joint supplements for almost two decades, but scientific studies are raising questions about their effectiveness. So Why Isn't Glucosamine and Chondroitin The Best Solution? Clinical studies for glucosamine and chondroitin have produced mixed and contradictory results, meaning that there is a risk they can have the opposite of their intended effect and actually make your dog’s joints worse. What’s worse is that glucosamine and chondroitin are sourced from unclean and unethical animal byproducts. Did you know glucosamine is sourced from shellfish? (Like humans, some dogs have severe shellfish allergies.) Did you know chondroitin comes from cow tracheas? Or that hyaluronic acid comes from rooster comb? These ingredients are often tainted, poor quality, and carry their own set of complex health dangers. Wag Lifetime Joint Care – The Only Solution Your Dog Will Ever Need! 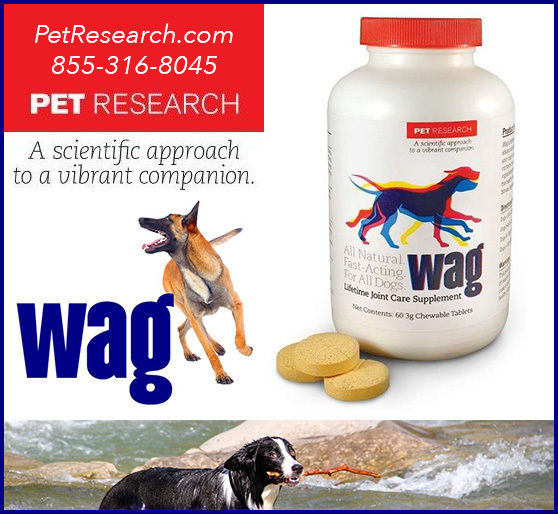 In spring of 2012 Pet Research introduced its first product, Wag Lifetime Joint Care. For the past two decades not much has changed among joint products available for dogs. That left the owner of a suffering dog with two options: put your dog on an unsafe NSAID like Rimadyl or take your chances with superstore supplements lacking any scientific evidence to support their efficacy. Pet Research decided to create a third choice: Wag Lifetime Joint Care, the ultimate joint care supplement for dogs. The Only Health Supplement You Need To Ensure Your Dog’s Lifetime Joint Care! What Sets WAG Apart From Other Joint Supplements? Wag Lifetime Joint Care is all-natural and derived from safe sources like egg shells, which have been clinically shown to work miracles on dogs’ connective tissues such as joints, bones, ligaments, and tendons. Is It True That WAG Won New Product of The Year With Frost and Sullivan? Yes! Natural Eggshell Membrane (NEM), Wag’s flagship ingredient, proudly won the Frost and Sullivian Joint Health New Product of the Year Award in 2011. So How Soon Before I See A Difference In My Dog? You will start to see a change in your dog’s behavior and mood after as little as 7-10 days. Wag Lifetime Joint Care is an important part of the daily life of dogs of all breeds and sizes, helping dogs to lead an active and happy lifestyle free of unnecessary suffering and pain. Is WAG Made in the USA? Absolutely! Pet Research manufactures all of its products in the USA and provides a comprehensive list of all the ingredients in their patented formula so you can trust that what’s in the bottle is exactly what you think. Call us Today and tell us about YOUR dog so we can get you started!